Due to weather delays the October 2018 grand opening is postponed until March 30, 2019. 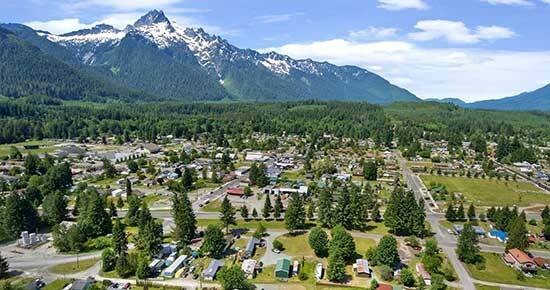 The Sauk-Suiattle Indian Tribe lives in a beautiful but remote area of the North Cascades Mountain Range in Snohomish County, Washington. For many years they have attempted to build a casino on their reservation, but their efforts failed. Finally with the help of a tribal economic development corporation, which is owned and operated by another Washington tribe, the Shoalwater Bay Indian Tribe, the Sauk-Suiattle Indian Tribe will soon achieve their dream. The Sauk-Suiattle are building a two-story, 9,000 square-foot casino and bingo hall. The location is about 6 miles from Darrington on Highway 530 toward Rockport. The property previously had a gas station and general store. Hours: Opens 10AM daily and closes midnight weekdays and 2AM Fri-Sat.